In 1935, Anti-Zogist elements attempted a number of times to overthrow the Zogist regime. But these attempts were more of the nature of plots and failed. In Albania the world economic crisis lasted longer than in other countries. In an artificial way, fascist Italy, which had the keys to the economy in its hands, created such conditions as to compel Albania to grant further concessions. At first Zog tried to resist with the aim of preserving something for himself, but finally he was obliged to submit to Mussolini's political, military and economic pressure. From this period, 1934 to 1935, Zog put Albania in complete subservience to Italy. In August 1935, anti-Zogist elements again tried unsuccessfully to overthrow the regime. The uprising, which is known as the «Fier Uprising» insufficiently organized and including wavering elements, was crushed right at the start. In order to calm the situation, in October 1935, Zog appointed a new «liberal- government. But the liberalism of this government was entirely formal, because when the workers of the Kuçova oil fields called a strike in order to demand their rights from the Italian proprietors, the government took sides with the latter and put down the workers' movement with violence. The situation which was created imparted a fresh impulse to the clandestine development of the communist movement, the only revolutionary movement with a perspective to save the country both from the Zogist oppression and from the menace of fascist occupation. The communist elements abroad, like Ali Kelmendi and others, helped in spreading communist ideas and in organizing the movement. 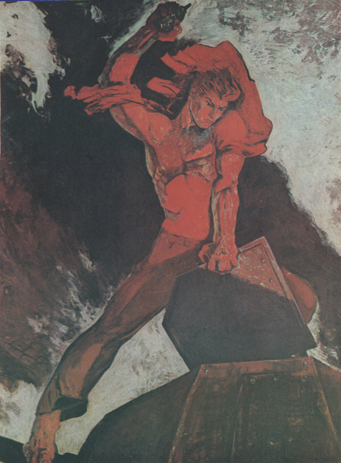 Many communists and revolutionary elements Went to the aid of the Spanish people fighting to defend the Republic from the intervention of the fascists and nazis. Zog sensed the danger of the communist movement in Albania. 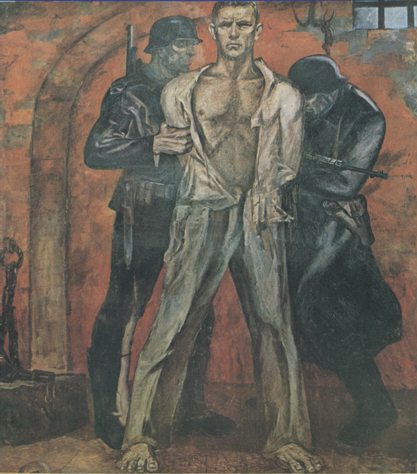 On the eve of the occupation of Albania by fascist Italy, the organs of his dictatorship launched a savage campaign against the communist movement; they made many arrests and imprisoned or interned a large number of revolutionary elements. The economic and political agreements concluded between Rome and Tirana in March 1936 paved the way for the Italian military occupation of Albania. Mussolini now awaited only the opportune moment to act. Having received Hitler's support for his aggressive plans, and having ensured the silent approval of the Western Powers, at the beginning of 1939 he began to carry out his plans. Through the agents of his fifth column in Albania, Mussolini had taken measures to sabotage the resistance of the Albanian people. 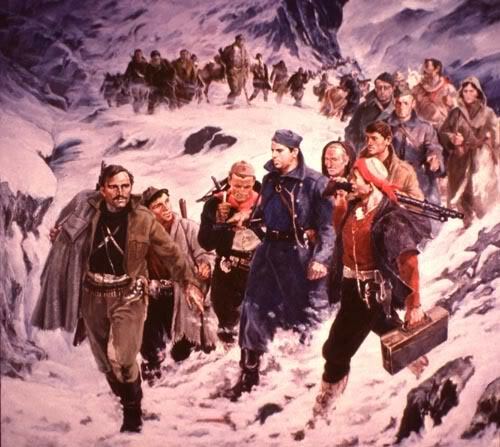 At dawn on April 7, 1939, the fascist troops began to land on the Albanian shores. The Albanian army had been left without ammunition, the few pieces of artillery had been sabotaged by the fascist instructors. Nevertheless, in Durrës, Vlora, Saranda, Sh6ngjin and everywhere the invading Italian troops encountered the armed resistance of the Albanian patriots. Groups of soldiers and volunteers who managed to secure some ammunition made the enemy bleed. The Italian fleet bombarded Durrës and the other ports. The Italian airforce carried out incursions over the cities of Albania. King Zog I with his royal family and his clique abandoned the country -and fled abroad. led the efforts to form the Albanian Communist Party, and to organize the Anti-fascist National Liberaliton War. Units (çeta) of fighters veére set up, which carried out actions against the fascist troops, like that of Peza, which during the years 1940-41, inflicted losses on the irivaders. In May 1941, Victor Emmanuel III, Emperor of Italy, came on a visit to Albania, In the centre of Tirana the worker Vasil Lagi, fired shots at him. The efforts of the möst resolúte communists, headed by Enver Hoxha, evercoming many difficulties, succeeded in creating th.e conditions for the mërger of the communist groups, which were acting separately. 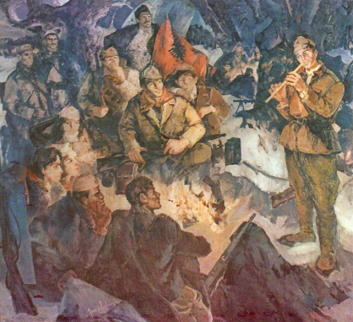 On November 8, 1941, the representatives of the groups gathered in Tirana in the greatest secredy, and formed the Communist Party of Albania. The Party took upon itself the great historic task of orgànizing and leading the general armed uprising against fascism for the liberation of the country and the establishment of the People's State Power. The meeting elected the Provisional Central Committee. 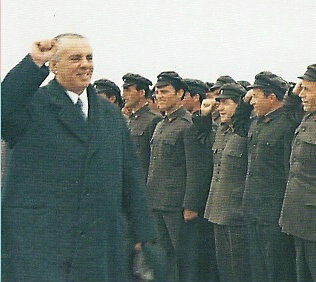 Enver Hoxha was charged with the leadership of the Central Committée. 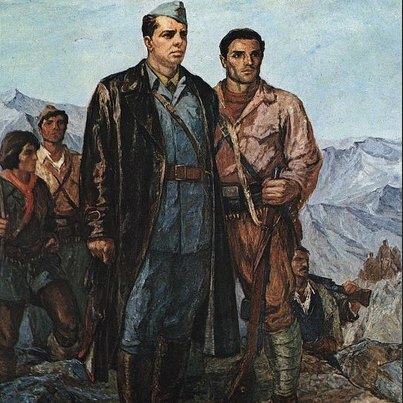 Tubo weeks after the founding of the Communist Party, on November 23, 1941, and also in Tirana, the organization of the Communist Youth of Albania was formed, with the young man, Qemal Stafa, member of the CC of the Communist Party of Albania as its political secretary. 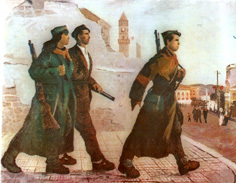 The formation of the Communist Party of Albania was accompanied with militant activities. In the cities powerful anti-fascist demonstrations broke out, which ended in bloody conflicts. 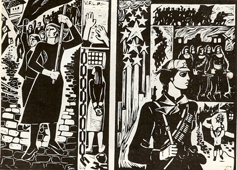 The communist worker Kog Bako was killed in the demonstration on November 8 1941. With their exemplary bravery and courage, the communists won the sympathy of the broad masses o: workers and the revolutionary and patriotic youth. The fascist ruling circles in Albania could not agree with the new situation which was being created, and immediately began to take energetic measures. 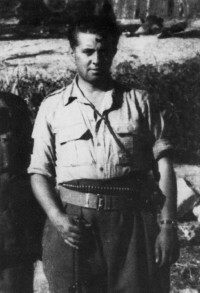 The Quisling Government of the big feudal lord Shefqet Vërlaci, as any other anti-popular reactionary government could being not capable of strangling the Albanian resis tance, was replaced by another fascist government, that of Mustafa Kruja, an old agent of fascism, notorious for his barbarity towards the freedom fighters and the people. The ruthless measures taken by the new fascist government further aggravated the situation in the country. 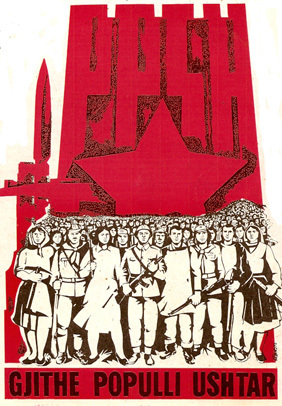 The Communist Party extended its armed struggle in the cities through guerrilla units, partisan and volunteer detachments were set up and the acts of sabotage and diversion became more widespread. 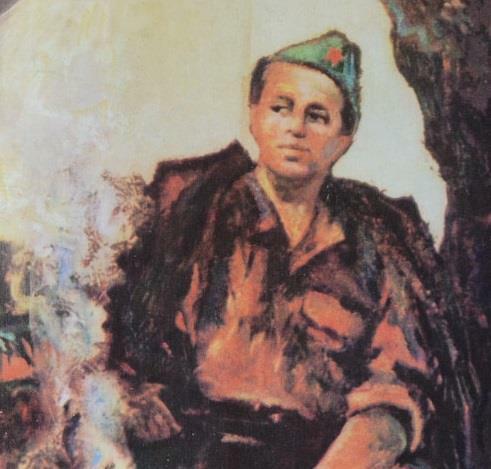 On May 5, 1942, Qemal Stafa, Political Secretary of the Communist Youth organization, was killed in battle with the fascists in Tirana. The Party was s-hedding the blood of its finest sons and daughters for the cause of freedom. 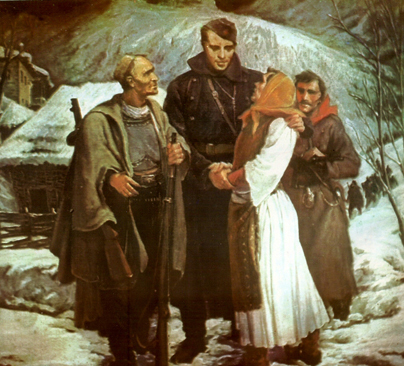 One and a half months later, three communists, Perlat Rexhepi, Branko Kadia and Jordan Misja, besieged in a house in Shkodra, fought the fascist troops with unprecedented heroism for hours on end. «Zëri i popullit» (The People's Voice), organ of the Albanian Communist Party, was published illegally. In September 1942, the Albanian National Liberation Conference was held at Peza, a village 18 km southwest of Tirana. 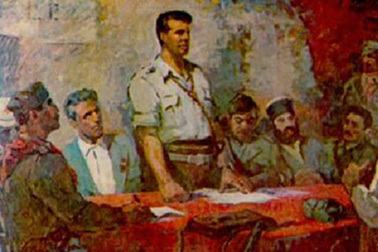 The Conference of Peza, which was organized on the Albanian Communist Party, laid the basis for the union of the Albanian people in a single national liberation front. The program adopted at the Conference of Peza laid down the task of waging uncompromising war against fascism and the traitors for a free, independent and democratic Albania. It also laid down the task of forming national liberation councils everywhere as organs of the union and mobilization of the people in the war and as organs of the People's State Power. The Conference of Peza had wide repercussions. 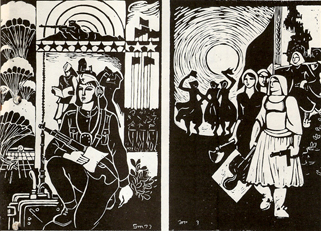 All over the country the anti-fascist movement and the war assumed a fresh impluse. From day to day the partisan units were increased and the armed struggle extended. By the end of 1942, the number of partisans reached 2,000 fighters, besides several thousand others who took part in the guerrilla units of the cities and the village detachments. Whole districts like Peza, Kurvelesh, Skrapar and others had been liberated. In order to destroy the partisan forces, from September to December 1942, the occupiers, using big forces carried out punitive operations in 27 districts of Albania, burning whole villages and massacring the population. The foreign occupationists and the local reactionaries accompanied these military operations with political activities especially by setting up collaborationist organizations like that called «Balli Kombëtar» (National Front). The Communist Party acted with great maturity towards this organization, which at first, included elements misled by enemy propaganda, exposing the real aims of this organization and enlightening those who had been deceived. 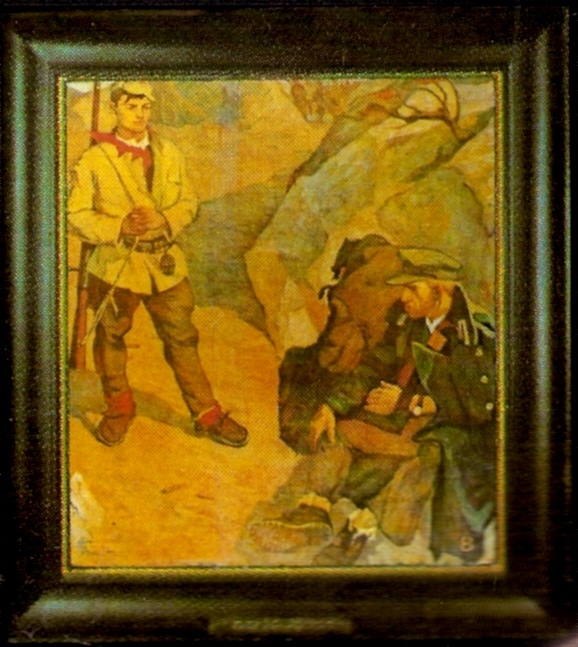 Later the «Balli Kombëtar» was obliged to come out in its true colours and was abandoned by the rank-and-file people who had been misled by the pseudo-nationalist demagogy of its leaders. 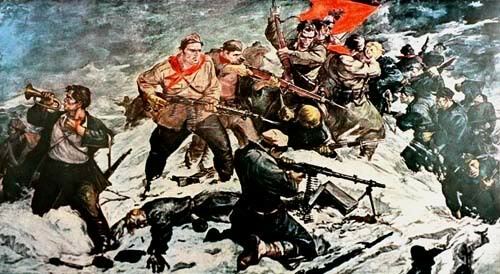 The successes which the National Liberation mcvement scored in 1942, made it possible, in the Spring of 1943, to place on the agenda the organization of the gene' ral armed uprising against the invaders. This task was concretized at the First National Conferenee of the A:.banian Communist Party which was held at Labinot in the Elbasan district from March 17 to 22, 1943. Meanwhile, under the new conditions of the si%uation, the fascist circles, tried, at the beginning of 1943, to take certain new political measures in order to stop things which in fact were developing to their disaddantage. The government of Mustafa Kruja.was replace~ by several other governmehts one after the other. 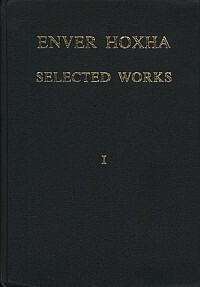 Rame promised that it would make some changes in its econemic policy towards Albania; Francesco Iacomoni, who had been at the head of the Italian Diplomacy in Albania before the occupation, was removed from hispost as `iceroy; the Albanian Fascist Party was replaced by a sinlilar organization under a new label. 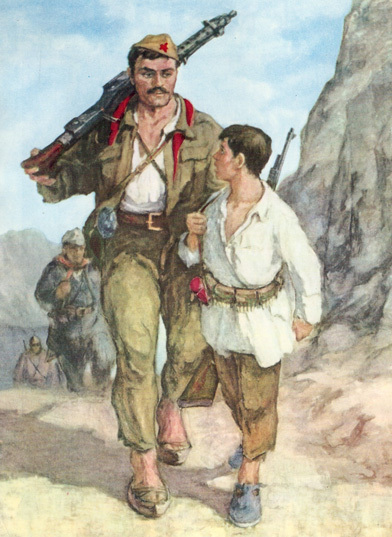 The good work done by the National Liberation Front under the guidance of the Albanian Communist r-arty brought about a big increase in the number of pardsan units and battalions during Spring in 1943. Now the acdons carried out were no longer isolated ones against fascist troops where they were stationed or in transit, but ac•ions skilfully coordinated by the CC of the ~lbanian (Ámmunist Party and, led by it, by the Regional Party Committees. Such were a number of operations carried out irom the end of June to the end of July 1943. 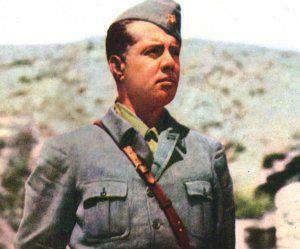 While the Gelieral Staff of the National Liberation Army with the Secr?tary General of the Central Committee of the Albanian Communist Party, Enver Hoxha as its Commissar, was set up at Labinot (near Elbasan) a number o f operatlons against the fascist troops were taking piace at Krraba Pass (on the Tirana-Elbasan highway), at P,~)jska of Pograd-ec, at Leskovik, at Kuqar of Përmet, up to Mezhgoran and Kiçoku Pass near the town of Tepelerla. At the same time, the Italian fascists carried out operktiòns against the population in the districts of Peza, Mallakastra, etc. The creation of the General Staff on July 10, 1943, made it possible to concentrate the military, strat,&gic and operational leadership of the National Liberation Army in one supreme organ. At the time when the General Staff was set up, the National Liberation Arfmy included in its ranks 10,000 fighters organized in regulak. partisan units. A few days prior to the form.ation of the General Staff, the partisan units launched their first attack on German troops on a motorized column which came from Macedonia and entered Albanian territory on its way to Yannina (Greece). The attack was launched on July 6, 1943 at the village of Sarmash in the Kolonja district. Taken by :surprise, the nazis suffered heavy losses in men and military equipment. In reprisal they burned the entire village of Borova and kilied a)1 the inhabitants they managed to capture (107 meri, women and children). The setting up of the General Staff, the rapid increase of partisan formation, battalions, and groups, the preparations for the formation of the First Shock Brigade, which was formed on August 15, 1943, alt greatly alarmed the Italian command in Albania. It took new measures in order to destroy the National Liberation Army. Four divisions, reinforced by artillery troops and supporbed by aircraft, began a new operation in the Mallakastra zone and later in o! 'zer zones. The local situation was complicated also because at this time the allied troops landed in Sicily. 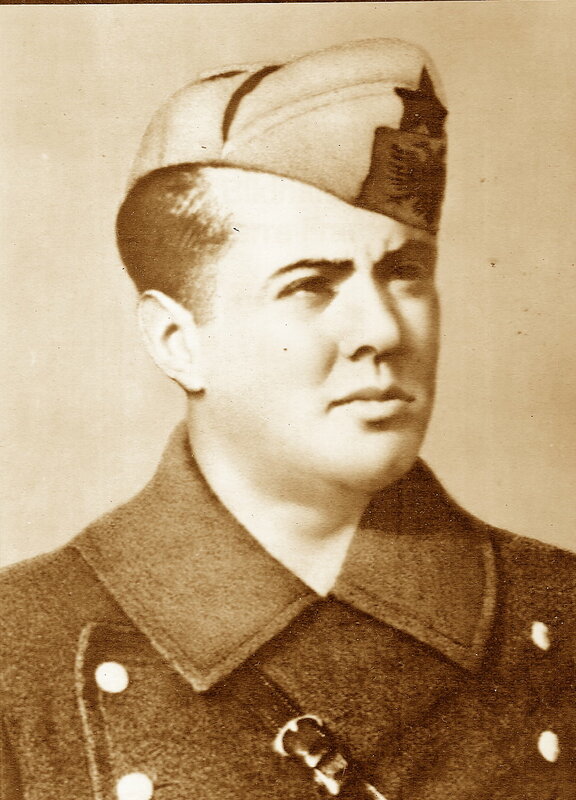 The «Balli Kombetar», Which now saw that fascist Italy was on the eve of total defeat in expectation of an allied landing on the Albanian -coast, hastened to launch open attacks against the partisan forces in collaboration with the Italian army. Italy's capitulation on September 8, 1943 created entirely a new situation in the country. 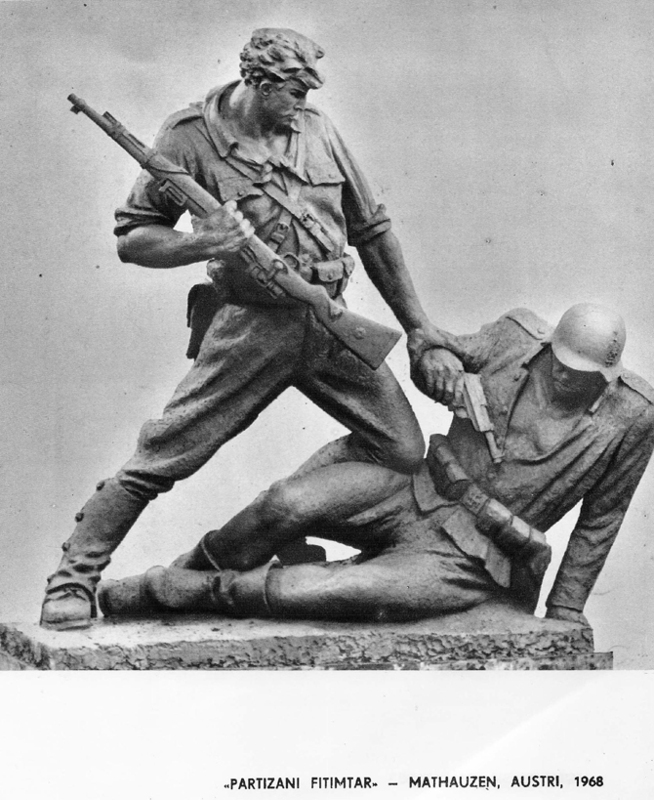 On instructions from the Central Committee of the Communist Party of Albania and the General Staff of the National Liberation Army, the partisan units called on the Italian troops to stop their military operations and join the partisans in order to fight the German nazis who were hurriedly taking the place of the Italians. The Italian command refused, and most of the Italian troops surrendered to the nazi forces. 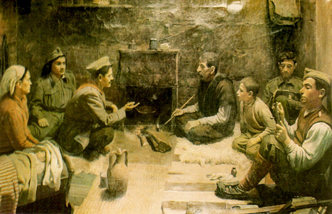 A number of armymen were dispersed and found shelter among Albanian peasant families, who displayed a fine spirit of magnanimity to the defeated enemy. The people shared their meagre food with these former soldiers. A small number of Italians joined the Albanian partisans and later formed a partisan detachment of their own, which took the name of «Antonio Gramsci». The nazi troops, who came to Albania, encountered armed resistance from the forces of the National Liberation Army everywhere. The heaviest fighting took place in the vicinity of Vlora and extended over more than twenty days. 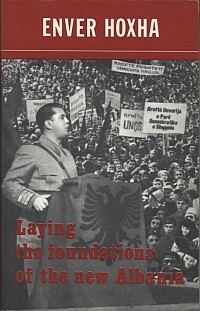 Under conditions of the relentless war with the partisan forces, the nazis tried to stabilize the situation in Albania. They very quickly came to terms with the «Balli Kombëtar» and all the reactionaries. In the early months of the occupation, they tried demagogy to create the impression that they supported the initiative of the «Nationalists» (imlpying the collaborationists) for the creation of an «independent» Albanian State. At the same time, another organization was set up, instigated in particular by the Anglo-Americans, which had the aim of rallying the former sympathizers of King Zog. This organization is known as «Legaliteti» (Legality). 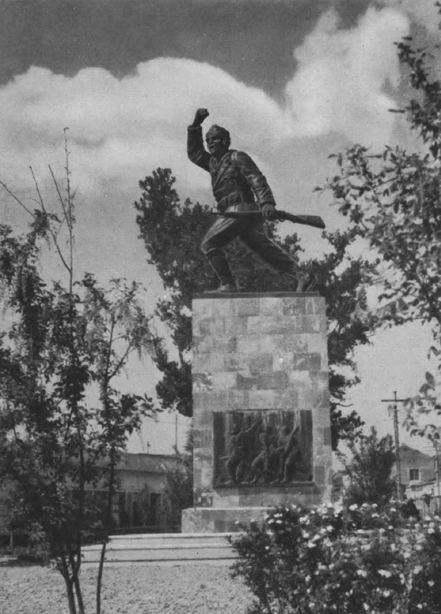 By mid-October 1943, the partisan units had liberated whole districts, and even certain number of towns, while Tirana itself was surrounded by the partisan forces. On October 18, on the eve of the opening of the so-called «Constituent Assembly», under the protection of German bayonets, the partisan artillery of the 3rd Shock Brigade shelled the palace where the meeting of the traitors was to be held. It was clear to the Germans that the partisan forces were so strong that, in order to cope with them, it was necessary to engage in major military operations themselves. For this purpose parallel with demagogic measures, the German command quickly prepared a large scale military operation which is known in the history of the National Liberation War as HThe Winter Campaign of 1943-44». In this campagin, which started in October 1943 and ended in February 1944, four Hitlerite divisions were engaged as well as a large number of collaborationist troops from the Quisling Government, «Balli KombëtarN, . "Legaliteti» etc. These troops numbered 45,000 men against 10,000 partisans included in the units of the National Liberation Army. The enemy tried to liquidate the partisan units, to destroy their bases in the countryside, to liquidate the leadership of the National Liberation Movement, the Central Committee of the Albanian Communist Party and the General Staff. The partisans and the people as a whole demonstrated unprebedented heroism at this stage of the war. 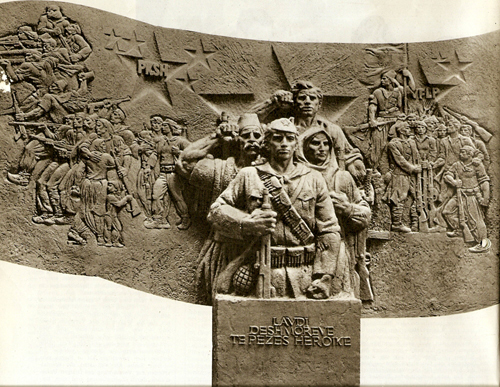 The march of part of the lst Brigade in February and March 1944, which penetrated deep to the rear of the enemy from Southern Albania to regions of Central Albania, has become a legend. The «Winter Campaign» was a total failure for the Germans and their collaborators. 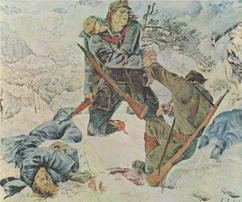 Although it had to pass through very difficult situations, although it lost about 1,000 partisans killed or died under the difficult conditions of the winter, the National Liberation Army emerged stronger than ever. 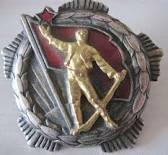 Instead of the three -brigades which it had in autumn 1943, it now had seven brigades of partisans in action. The National Liberation Army launched a counter-offensive, and in a very short time liberated all the districts which the enemy had moved into during the operation. 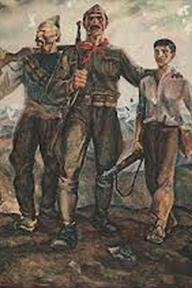 The victories scored by the National Liberation Army in spring 1944, enabled the Albanian Comm- Party to take new political initiatives of decisive impartance for the future of the country. 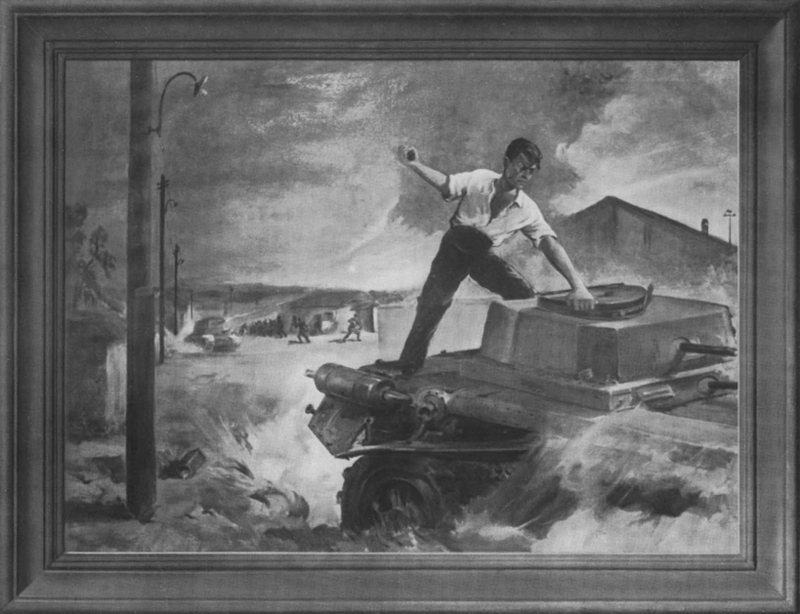 In the conditions when the Red Army under J. V. Stalin, was striking crushing blows at Hitler's army in the East and when the allied armies were fighting in Italy, major problems arose for our country. The reactionaries, in contact with the reactionaries abroad, tried to manoeuvre so that they, with the aid of the Anglo-Americans, would take power into their hands once the Germans had been defeated. In these conditions, preparations were made for calling HThe First Anti-fascist National Liberation Congress. which. met in the liberated town of Përmet on May 24, 1944. 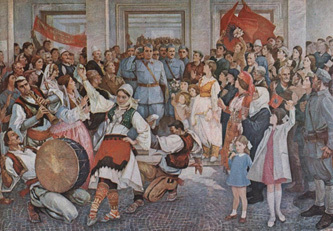 The Congress took decisions of extreme importance for the future of Albania. It solved the problem of political power in favour of the insurgent people, and-. founded the first Albanian State of People's Democracy. The .decisions of the Congress formed the basis of the Constitution of the People's Republic of Albania. 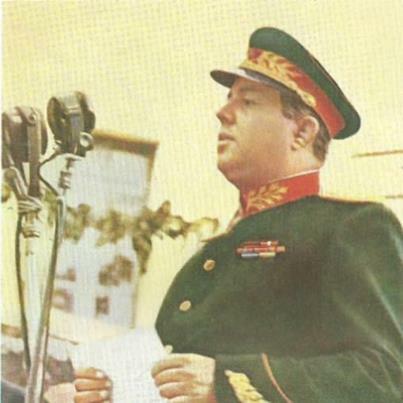 Before the proceedings of the Congress ended, the National Liberation Army had received orders to launch the general offensive for the complete liberation of Albania. 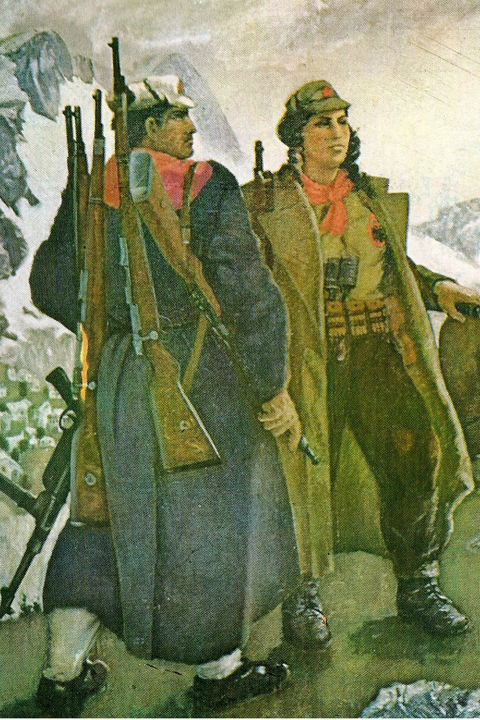 The lst Division of the National Liberation Army was created and set out for action in Central and Northern Albania in order to strengthen the movement even in those regions where the reactionaries had dug themselves in. 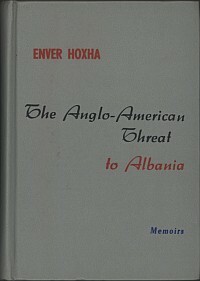 In this undertaking the command of the National Liberation Army encountered the opposition of the AngloAmerican Mediterranean Command, which aimed at preserving the positions of the reactionaires in Albania. But those plans came to naught. 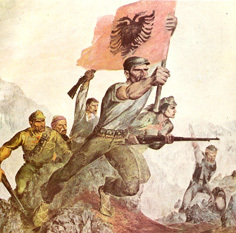 After successfully coping with a new enemy operation (the German operation of June 1944) involving 50,000 enemy troops (four and a half German divisions and some thousands of collaborationists), the National Liberation Army liberated the districts of Central Albania, Dibra, Mirdita and the north. 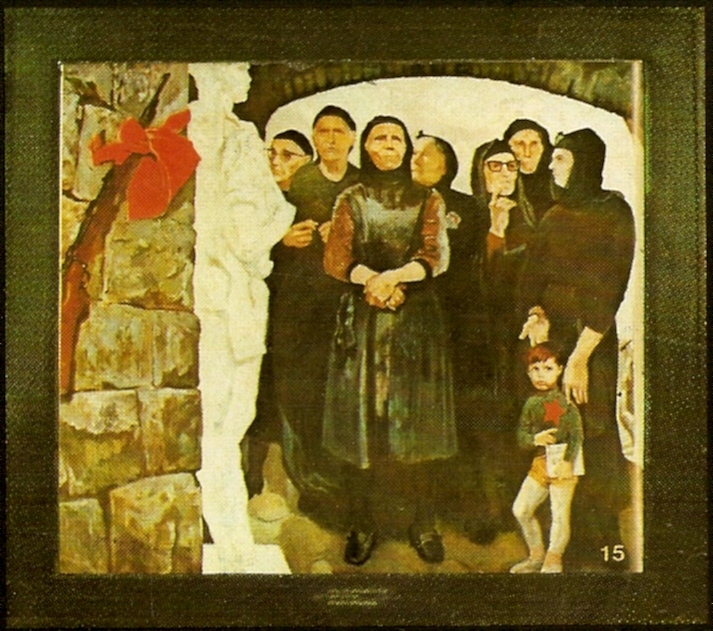 Autumn, 1944 also saw the liberation, one after another, of theci'ties of Albania. 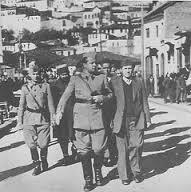 On October 22, 1944, at its second meeting, held inthe liberated city of Berat, the AFNLC decided to change the Anti-fascist Committee into the Democratic Government of Alb nia. 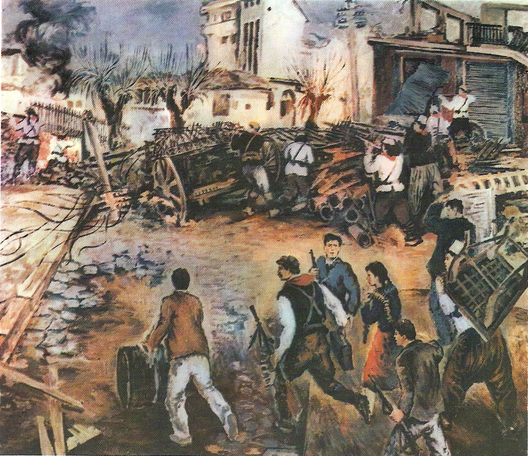 The forces of the National Liberation Army fought an heroic battle lasting 19 days against the Hitlerite troops for the liberation of the capital, Tirana. Tirana was liberated on November 17, 1944. The Democratic Govern-. 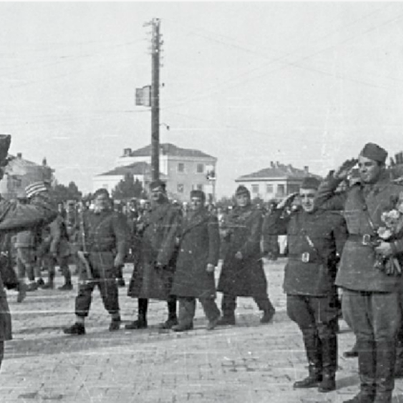 ment entered Tirana on November 28, 1944. The next day, the partisan brigades also liberated Shkodra, the last city held by the Germans. T hat day marked the complete liberation of Albania. 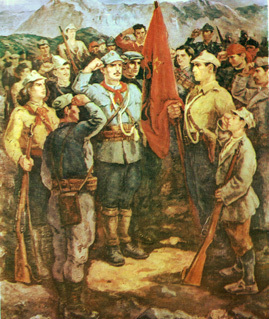 On orders from the Commander-in-Chief of the Na-tional Liberation Army, Enver Hoxha, and in the spirit of proletarian internationalism, two Divisions of the National Liberation Army crossed the borders of Albania to Yugoslavia, where they took part zn the fighting for the liberation of Macedonia, Kosova, Montenegro up to Southern Bosnia. Thus, even outside Albania, hundreds of sons and daughters of our people gave their life's blood. 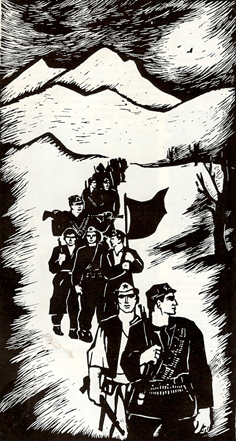 for the great cause of the peoples, the victory over fascism. 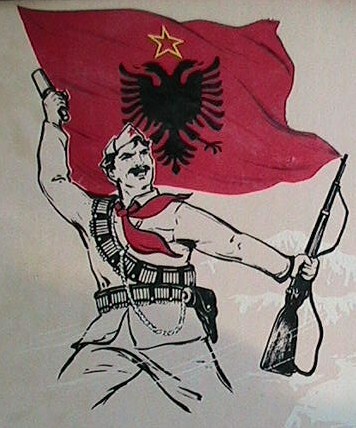 In this way, the Albanian people, led by the Communist Party of Albania, scored the most brilliant victory in their history. They took political power into their own hands, opening the way for the triumph of the revolution and socialist construction in Albania. Although Albania then had a population of only one million, it made a valuable contribution to the cause to defeat fascism. It pinned down 15 Italian and German divisions, putting out of action 70,000 enemies killed, wounded and taken prisoner. 700,000 fascist tropps trampled the 28,000 square kilometres which is the total area of Albania. For every square kilometer one freedom fighter gave ~his life. Whole districts and cities were razed to the ground. The economy of the country was totally devastated. On the eve of liberation, the Albanian National Army had in its ranks 70,000 partisans incorporated in three army corps (six divisions). The great victories of the National Liberation War became the basis of the post-Liberation victories. Always under the leadership of the Communist Party (now the Party of Labour) of Albania, Albania is marching with sure steps towards the complete construction of socialism.